Gaming Writer Tom Martin looks back on the life and crimes of Rockstar's record breaking and controversial game, Grand Theft Auto V. Should this game still be stealing players time? Taking into account that I am not very old, and my short-term memory leaves a lot to be desired. It is the absolute truth that I cannot remember a world without Grand Theft Auto V. In fact, you would have to go back to 2013 to be at a time where this game wasn’t at the peak of seemingly every gaming retailers list of ‘top selling games’; back to 2011 to be at a time where it wasn’t the centrepiece of every speculative news piece or on the main stage of every convention. This game was big to say the least. And so, it is the case that Rockstar’s flagship property turned a grand old (GTA) 5 years old in September - and bearing in mind the release of Red Dead Redemption 2, we perhaps find ourselves quickly moving toward a day where Trevor/Michael/Franklin are no longer the gamer’s husk of choice whenever we feel enacting some mindless chaos. The madness began in 2011 with the announcement that GTA V was indeed in full development. Promising ‘fast cars at your fingertips’, ‘friendly neighbours’, ‘leadership you can trust’ and ‘affordable healthcare’, GTA V in 2011 was already shaping up to be the perfect fantasy escape from the real world we wouldn’t truly need until 2016. All grim realities aside however, the game was billed to be a bold and ambitious new step in the open world genre. A living, breathing world featuring a functioning stock exchange, a possibly racist police force and 3 playable miscreants who would get up to their own random shenanigans when the player wasn’t making them drive over mountains in a golf buggy. In this it delivered. Albeit, sort of. The three playable characters were all well realised, deeply emblematic of three major demographics that players of the Grand Theft Auto series will have come to know well. These from Michael, the retired(?) bank robber, middle-aged with the stomach to show it, drinking beside his pool. Living the good life in a Vinewood mansion with his ever-resentful family, closely resembling Claude or Niko from GTA III and GTA IV respectively. To Franklin, the obligatory GTA grove street cookie-cutter gang-banger (in the vein of CJ from GTA: San Andreas) who dreams to shake the stereotype and go clean… for maybe one mission before he falls straight back into the criminal life. Last but by no means least, Trevor, who can only be best described as… Trevor. You might say Trevor seemed to be an introspective look at the player base of the Grand Theft Auto series: devoid of consequence, instinctual, pyromaniacal etc. Or, perhaps you could say he is representative of the ‘Bible belt’ American redneck stereotype. Either way, he’s Trevor. The three characters felt well balanced with each other in what was/is by far the best written game of the franchise. However, whilst looking back at the game in itself, we should also consider the undercurrent controversies that plagued it; It is in the characters we also run into one of the game’s primary controversies: Rockstar once again chose to forego the inclusion of a female protagonist. The representation of female characters in the game left a sour taste in the mouth for many gamers. 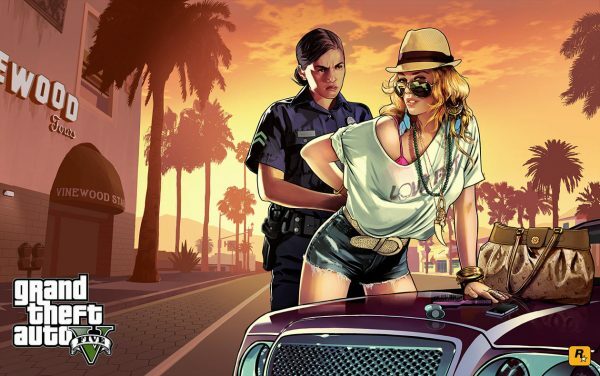 As Carolyn Petit asserts in her review of the game for Gamespot: “GTA V has little room for women except to portray them as strippers, prostitutes, long-suffering wives, humourless girlfriends and goofy, new-age feminists we’re meant to laugh at.” Examples include Michael’s serial polygamist wife, and his completely air-headed daughter who has ‘SKANK’ tattooed across her back (make sure to lift with your knees when you think about moving that heavy hand, Rockstar). In an interview with the guardian, Rockstar vice-president and head of creativity Dan Houser plainly stated, “The concept of being masculine was so key to this story". Whilst this is understandable in a game that is so satirical of the American lifestyle (in which toxic masculinity is prevalent), it is perhaps a shame that Rockstar couldn’t have made even one of it’s three protagonists female, perhaps attempting to explore that ‘masculinity’ from the side of a female lead. Once again however, with the good comes the controversy. Whilst the majority of the story is fun, meaningless chaos. In its attempts to shock Grand Theft Auto V went horrifyingly close to the grain in an uncomfortably personal depiction of torture. In the mission ‘By the Book’, the player takes control of Trevor as he “interrogates” a man, Mr. K, in an attempt to extract information. The player is encouraged to utilise various equipment and torture methods on the restrained man. For full context, here is everything you need to do to ‘100%’ the level: electrocute Mr.K, pull out Mr.K's tooth, hit Mr.K with the wrench, use waterboarding on Mr.K –all without stopping Mr. K’s heart (because presumably that would be too far)! Comparisons were quickly drawn to the infamous ‘No Russian’ mission from Call of Duty: Modern Warfare 2. In my opinion, the level was another example of Rockstar hiding their inherent need to shock behind the grim guise of satire. The level was completely gratuitous, with nowhere resembling the correct context that would be needed to excuse the depiction as a caricature of the supposed use of torture techniques by the United States of America government. In recent years gaming has faced great prosecution over its depiction of violence, and whilst I am often resolute to defend the medium I love, missions such as ‘By the Book’ are cases in which we can be said to have crossed a line. Less satire, more ‘sad’ and ‘dire’, it was a disturbed dampener on what was an overall engaging and fun story. A wide expanse it was too! GTA V’s map clocks in at around 49 square mile, this is still bigger than games considered to be large scale in today’s generation such as Fallout 4 and Zelda: Breath of the Wild, which clock in at 43mi2 and 22mi2 respectively (thegamer)! What is more impressive is that GTA V was released originally for PlayStation 3 and Xbox 360! As you would expect from a game with a production budget of $137 million [£105million] (gamesindustry.biz), the game truly pushed the last generation of consoles to their very limits, and raised the bar for what gamers expected from next-Gen. It is also the combined excitement of the lush and exciting world and the potential of the heist gameplay that laid the groundwork for the wildly successful GTA V Online. Players waited with bated breath for the chance to crew up with friends or criminally like-minded strangers and embark on multiplayer heists across the world of Los Santos. Gamers would be waiting a while for this anticipated feature however. Almost two years in fact! On March 10th, 2015, Heists were added to GTA V Online and after a short period of server troubles, received great critical acclaim. Some of my fondest memories of the game are playing through those heists with high-school friends… until their parents turned their internet off. When I began this retrospective, I was excited to revisit a game I had so enjoyed just a couple of years ago. However, researching the game’s torrid surroundings has truly cast a shadow over it. Looking back on Grand Theft Auto 5’s time at the forefront of the gaming world it is easy to see a lot of positives. We see a game that pushed the boundaries of what we thought was possible for a whole generation of games. Players were given a glimpse into the possibilities of a living, breathing sandbox world in which you could do anything your heart so desired. However, we also see shock, distasteful representations, community sanctioned toxicity and disturbing gameplay. GTA V deserves is accolades, truly, but Rockstar must do more with its platform if the Grand Theft Auto series truly wishes to play the role of satire. Until then, happy 5 years ya glorified money printer.